The Toyota Sienna has long been a popular pick for Canadian families after a minivan known for quality, safety, reliability and high residual values, and today, recent updates and enhanced value make it an even more attractive choice than ever. Last year, the Sienna became one of just 20 products to receive a ‘Today’s Parent Approved’ Seal – an endorsement intended to reassure parents that the purchases they make have the confidence of the publication’s readers and editors. With room for eight, a tremendous list of safety feature content, and the size, space and flexibility that today’s families demand in a minivan, the Sienna proves it has what it takes to be a Canadian family favourite. Find out more about the 2016 Toyota Sienna on the Milton Toyota website. Toyota’s Driver Easy Speak is one feature loved by parents across the country, as it allows parents in the front to direct a one-way conversation to their kids in the back via the stereo speakers and a built-in microphone. “The innovative technology and features we put into the Sienna are done to maximize the safety, comfort and convenience of families, which makes this special recognition from Today’s Parent particularly gratifying,” said Larry Hutchinson, Vice President, Toyota Canada Inc.
Further, Sienna is the only minivan in Canada available with All Wheel Drive (AWD) for maximum winter driving confidence, and it’s offered in numerous trim grades, and with numerous options packages that allow shoppers to devise the perfect Sienna for any need, lifestyle or budget. All models are available with an impressive array of feature content designed to make family travels easier and more comfortable. Starting with power sliding doors, a power tailgate, and push-button locks and ignition, Sienna drivers appreciate easy access to their ride, especially during busy family outings or shopping trips. A high-tech display audio system up front puts mom and dad in touch with media, communications and information functions quickly, while available rear-seat entertainment consoles and premium stereo systems keep all occupants comfortable on voyages short or long. Premium feature content includes a 120-volt power outlet, a wide-angle backup camera, dual power moonroofs, rain-sensing wipers, multi-zone climate control and plenty more. All said, whatever the need, the Sienna offers up features and systems to make every family road trip comfortable and relaxing. Drivers can enjoy the open road with exceptional fuel efficiency as well — thanks to Toyota’s highly-proven 3.5-litre V6 and six-speed automatic transmission combination. Proven, robust and reliable, the Sienna’s powertrain team is noted for robust performance, exceptional cruising mileage, and long-haul durability. 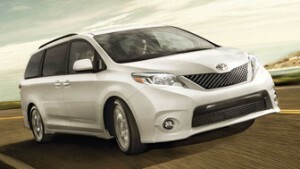 For safety-minded parents, the Sienna covers all of those bases as well. For 2016, the Sienna is offered with eight standard airbags, child protection locks, and the Star Safety System, which networks six advanced technologies that work with your safe driving for maximum control and safety in all driving conditions. Automatic lights, wipers and high-beams are also available, ensuring optimal visibility in all driving conditions. Add in the generous cargo capacity, a tremendously versatile interior, and a finely-tuned ride with a focus on peaceful comfort, and you will quickly find the Sienna to be the market’s most confident and compelling minivan value. The 2016 Sienna is available now, with pricing from $31,675.